Kyler Murray, a junior from Oklahoma University, had decided to opt into the 2019 NFL Draft. The 5’10” 195 lb. quarterback transferred from Texas A&M to Oklahoma in 2016. His career passing statistics include 4,719 yards, with 45 touchdowns and 14 interceptions. He had a passing completion rate of 68.3%. He also rushed for 1,330 yards and 12 touchdowns. Kyler Murray’s Wonderlic score from the NFL Combine was leaked to the public on April 22nd, and he reportedly scored a 20. To see how his score compares to the other quarterbacks in his class, check out our 2019 Wonderlic results. The Wonderlic test has been a component of the NFL Scouting Combine since the 1970s. The cognitive ability test gauges a person’s ability to quickly assess and answer questions. Test takers get 12 minutes to answer 50 questions with one point available for every correct answer. Only one player has ever received a perfect score, former Cincinnati Bengals punter Pat McInally. Check out our huge database of NFL Wonderlic scores, or try the 50 question sample Wonderlic test for yourself. 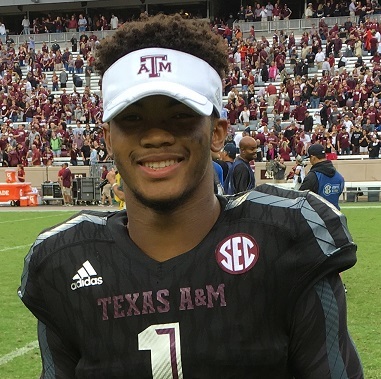 Kyler Murray set the college football world on fire in 2018 with his cannon arm and lightning speed which ultimately led him to winning the Heisman Trophy and an appearance in the College Football Playoff. Few players have inspired fear in defenses like Kyler Murray was able to with the aid of a talented offensive cast of Oklahoma Sooners. Murray threw for over 4,000 yards while also running for 1,000 yards in 2018, an almost unthinkable feat for a college quarterback. Overall, he accounted for 54 offensive touchdowns between his exploits in the air and on the ground. Not surprisingly, given his athletic abilities, Murray is also an exceptional baseball player and was a first-round draft pick by the Oakland A’s. Many assumed he would forgo football and pursue baseball after finishing the 2018 season, but Murray ultimately made the decision to enter the NFL draft. Where his career goes from here is anyone’s guess.